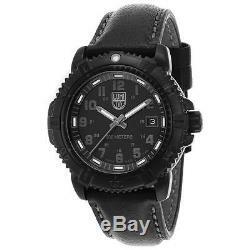 Luminox Modern Mariner 7250 Series Black Dial and Genuine Leather Strap. Add this Luminox timepiece to your collection that is part of the Modern Mariner 7250 Series. It features a sturdy black genuine leather strap that has grey contrast stitching. The black dial is accented with grey Arabic numerals and hands. The dial is a 38mm black ion plated stainless steel case. Own your own Luminox Modern Mariner today! This Steel Colormark watch is elegant, yet durable with its trendy all-black design and useful 200 meter water resistance that can take you just about anywhere. Ronda 705 HH6 Swiss quartz movement. Black dial with luminous hands and markers. Black ion-plated 316L steel case with crown protection. Sapphire glass crystal with anti-reflective coating. Night vision illumination tubes (constant light for up to 25 years). Genuine black leather strap with grey stitching and signature brushed buckle. Date display at the 3 o'clock position. Water resistant to 200 meters (660 feet). Case width 38mm (approximately 1 1/2 inches). The item "Luminox Modern Mariner 7251. BO Series Black Dial and Genuine Leather Strap Watch" is in sale since Tuesday, May 2, 2017. This item is in the category "Jewelry & Watches\Watches, Parts & Accessories\Wristwatches". The seller is "magical8ezg" and is located in Westfield, New Jersey. This item can be shipped to United States, Canada, United Kingdom, Denmark, Romania, Slovakia, Bulgaria, Czech republic, Finland, Hungary, Latvia, Lithuania, Malta, Estonia, Australia, Greece, Portugal, Cyprus, Slovenia, Japan, Sweden, South Korea, Indonesia, Taiwan, Thailand, Belgium, France, Hong Kong, Ireland, Netherlands, Poland, Spain, Italy, Germany, Austria, Israel, Mexico, New Zealand, Philippines, Singapore, Norway, Saudi arabia, Ukraine, United arab emirates, Qatar, Kuwait, Bahrain, Croatia, Malaysia, Brazil, Chile, Colombia, Costa rica, Panama, Trinidad and tobago, Guatemala, Honduras, Jamaica, Antigua and barbuda, Aruba, Belize, Dominica, Grenada, Saint kitts and nevis, Saint lucia, Montserrat, Turks and caicos islands, Barbados, Bangladesh, Bermuda, Brunei darussalam, Bolivia, Ecuador, French guiana, Guernsey, Gibraltar, Guadeloupe, Iceland, Jersey, Jordan, Cambodia, Cayman islands, Liechtenstein, Sri lanka, Luxembourg, Monaco, Macao, Martinique, Maldives, Nicaragua, Oman, Peru, Pakistan, Paraguay, Bahamas.